If you have been thinking to use sparklers at your wedding, you probably are doing research on ideas for the big send off, how to let the guests know when and how to use them, how to deliver them and of course, how to display them before they are used. There are many ways in which you may display them in case you already decided that you want to have them in a certain place to have the guests take them at a specific moment. Here you have some ideas for holders you can use to make them look amazing. These vases are ideal for decorating while displaying your sparklers until the time to use them comes. The greatest part about these is that after your wedding, you can use them at your home as containers, flower vases or anything that comes to your mind. They come in a set of four and you can customize them by adding your engraved initial. They are specially made for our 9 inch sparklers, but you could be creative and used them with other type of sparklers. If your wedding theme is rustic, these vases will fit in just perfectly! If you are trying to find a perfect holder to create a romantic ambiance in your wedding, these vases are what you are looking for. They are a perfect fit for our 9 inch sparklers. These vases are made with thick glass at the bottom so you can be sure they are super resistant. You can decorate them with flowers to make them look even more romantic. In addition, you can personalized them by adding up to three characters, perfect to have your initials! After your wedding, these can be used as flower vases or for anything that comes to your mind. Now, if you want to use something created with your own hands, there are plenty of vases you can do. For instance, you could use galvanized steel buckets. The good side of these is that you can paint them in any color you want (and match your wedding theme) and add decoration such as flowers or laces to make them look better. You could also fill them with sand so once the send-off is done, guests can use them to dispose the used sparklers. There are many ways in which you can display your sparklers, just let your imagination fly. Sparklers are lately gaining more popularity to be used at weddings because they are not only fun but also magical and unique, especially when utilized at night. Regardless of when and where you use them, the entry, the walk to the altar, the first dance or the exit, they will provide your wedding with a special touch and will be memorable for you and your guests. There are certain aspects you should take into account when including sparklers at your wedding ceremony. First of all, make sure to confirm the venue where your ceremony will be held on allows the use of sparkles either inside or outside. Due to state regulations, some venues prohibit the use of any type of fireworks, including sparklers and you do not want to get surprised the day of your wedding. Second, you must inform your guests that you plan to light sparklers at some point of your ceremony. It is important to let them know when you planned to use them so you avoid random sparklers being lit at a bad timing. Guest with sparklers are like kids with new toys, they cannot wait to use them! You can print instructions to use together with the sparklers or have someone in charge of explaining how and where they will be used. Third, it is important to advise everybody about the preventive measurements they must have when using sparklers. It is much better to take extra time to explain how to use them and what must not be done that having an accident. Fourth, provide a tool to light the sparkles such as lighters or matches. Ensure there are enough for all the invitees so when the time to light them comes, everyone is able to participate of the special event. Fifth, you have to designate a special place for the guests to safely turn off their sparklers. A great idea is to fill buckets with sand. Sand is usually cold so you will be sure they will for sure turn off. Finally, do not forget to let the photographer know in advance that you will use sparklers Wedding pictures that include lit sparklers are just breath taking. For that, the photographer must be aware so he brings all the necessary equipment and finds the best spot to get the greatest shots possible. Follow these simple advices and your sparkler’s send off will be a complete success! We already learned what sparklers are but not how they actually work. 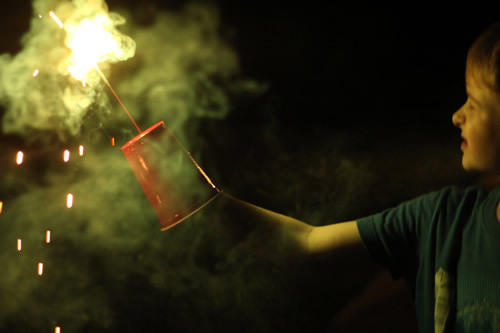 In this article, we will understand what exactly happens when you light a sparkler. Sparklers are little devices that burn for up to a minute, producing lots of bright sparks. They are made of different compounds which include fuel, an oxidizer, iron powder and a binder. Now let’s understand every component. The purpose of the metal powder is to provide the sparklers with its colored sparks. Each metal produces a different color. In our store, we use sparklers with Aluminum that produces white sparks. The fuel is a combination of carbon and sulfur. The fuel and the oxidant are mixed with sugar or starch and water. Then a wire is immersed in this mixture, so it will become a sparkler when dries. The mixture can also be poured into a mold and create another type of sparklers. Since the oxidizer and fuel are uniformly mixed with binding and iron or steel, the sparkler burns slowly and evenly along its length. Since sparklers contain so many different chemicals, please ensure you follow all the safety advice when using them. For instance, you must always ensure the sparkler is completely extinguished before you discard it. It is a great idea to have a container with water so you can place the burned sparklers to make sure none is going to accidentally start a fire. Also, make sure you keep an eye on any children manipulating a flare. Children must not use them by themselves so injuries are avoided. Sparklers are a great ally to enlighten any celebration and now that you know what they contain and how they work, you can feel more comfortable when using them! You have seen sparklers at holidays and parties, and now you are considering to use them at your wedding but you are not sure what exactly a sparkler is? Don’t worry, find here a comprehensive explanation and feel free to order your wedding sparklers having all the knowledge. Pyrotechnic is a set of devices that perform pyrotechnic devices inside. This means that they have a reaction which instead of exploiting, produces flames, sparks, smoke and others in a very controlled manner. Since they are beautiful and secure to handle, pyrotechnic devices have become widely used in all types of celebrations such as 4th of July, Christmas and New Year. Its use has spread; therefore, there is a huge variety of devices now that come from small fireworks to huge, Disney-like ones. Small fireworks are known as sparklers. Sparklers are small pyrotechnic devices with the ability to produce a very bright light. Due to this ability sparklers are used to light dark places, in military operations and mostly, in celebrations. Sparklers are wands with different lengths and that have the fireworks in their tips. Once they are lit, they produce an intense light followed by a release of flying sparks that quickly extinguish to prevent accidents. That’s why sparklers are one of the most used pyrotechnic devices in celebrations and holidays. Sparklers are composed by aluminium, magnesium or magnalium, which are the responsible for the white sparkles. Most of them are Class C explosives which are smaller, less powerful and with a very reduced risk of harm. Nevertheless, it is recommended to use them outdoors to avoid any type of incident. Now that you know what exactly a sparkler is, do not hesitate to visit our catalog and buy the sparklers that call your eye the most! Make sure your invitees never forget your wedding! One of the main factors in your wedding day, besides the importance of the moment when you’re your spouse to be finally promise to love each other forever, one in front of your loved ones, is also innovation. As you may know, new trends point to create different ways of celebrating, which many times end up by getting away from traditional and classic dances such as the waltz. Couples are now more interested in throwing a party that is not only romantic and magic, but also that will be unforgettable and stay in everybody’s mouth for long. Therefore, there is a great element that you could implement during the any moment of the ceremony. However, it will be especially fairylike if you are having a night ceremony. Usually, fireworks are used during Christmas and New Year as celebratory elements to show how turning a light on in the middle of a ceremony represents the importance and happiness that the event brings to everyone’s life. Then, why not using them at your wedding. It is a big celebration too after all. In addition, you will make your attendees active parts of one of the most important moments of your life. Sparklers are a great addition to your wedding because they will give a more enchanting element. Also, you do not need to make a big investment to get them, but the outcome will be enriching. You may read our previous articles to get ideas on how to include them to your ceremony, when to use them and how to safely handle them. The best part is that most likely you just need to distribute them and the guests will take care of the rest. Or, if you prefer, you may ask someone you trust to take the lead for it to be perfect. 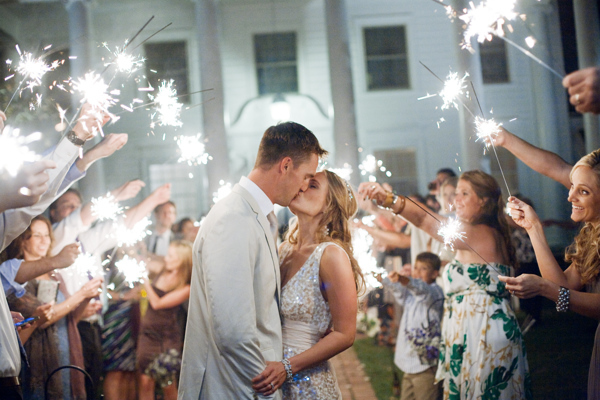 How do you think you can use sparklers at your wedding? Let your imagination fly! Do you remember how happy you felt when lighting sparklers at Christmas or New Year? Imagine how cool that be at your wedding! It is really great when all guests light their flares at once while the couple goes through. Today, weddings are increasingly customized and couples look more and more special details to make their wedding unique and unforgettable. There are too many beautiful details at weddings but what never fails are sparklers. Sometimes people tend to think that a lot of money is required to you have a cool, original and unique wedding. However, that’s a false idea. Little details are what make a wonderful atmosphere without leaving you broke. Sparklers may be used in different situations or at different moments to create a magical environment. You choose what works best for you! To introduce this element to your wedding, what about looking for a nice corner to place the wands in a very nice sparkler holder. Of course, you must make sure you ask the venue if they accept using sparklers, though they should. Sparklers are harmless! Here you can find glass sparklers vases which you could customize by engraving maximum three characters which could be your initials. You can personalize them more by adding a nice detail such as a ribbon or whatever you feel like adding to it to give it your own style. If you want to get the sparkler holders or sparkler signs, visit our store. Don’t think about letting sparklers out of your wedding, for they gill make it magical and unforgettable; your guests will definitely have something to talk about. Have you ever used sparklers? Those fireworks that with a very brilliant light that resembles a magic wand of a fairy. Sparklers are usually used during New Year’s Eve and to receive the New Year in a sparkly way. However, they have been becoming very popular in other holidays and celebrations. Weddings are not an exception. They are inexpensive but give a touch of magic to any wedding ceremony. What happens when a couple decides to include sparklers in their wedding, is that they have a hard time choosing the right moment to light them up. At the beginning, during the ceremony, at the exit, during the kiss. Whichever you choose, it will be unforgettable: Exiting the room through an aisle made of golden lights, entering a room only lit by the guest’s hands or opening the first dance under the romantic light of sparklers. There are plenty of possibilities, you just need to thing which will make you happier. In case you choose the last option—opening the first dance under the light of sparklers—you will find some ideas to make that special dance, a memorable moment. Why is it a good idea to use sparklers for the first dance? You will avoid the hassle of handing the wands when the invitees enter the venue. The final output will be spectacular. Dancing under the shiny light of those magic wands. You will make your guests be active participants of an important moment of your life. The first dance you will ever have as a married couple. Now, you may be wondering how to organize it. It is actually very simple. The best you can do is to make tags that read “Light me during the first dance” and put them on each table together with the sparklers and matches. One of each per invitee and place as many wands, matches and tags as guests you have on each table. In that way, everyone will know how exactly the sparklers must be lit. Dancing uniquely under the light of the sparks while the guests move them following the rhythm of the music, is an opportunity you don’t want to miss. It is easy to organize and it will be not only magical but a moment that will be captured by your photographer for history. Lately, weddings are not only formalities, but they are also—as they should have always been—a celebration of a couple’s love as well as a way for the bride and groom to share their love with their loved and special ones. Therefore, if you are getting married soon, you might be looking for wedding details that set you wedding apart from others. What better that finding a special feature that you can share with all the guests? That will definitely turn your wedding into an unforgettable one. An idea that is becoming really popular, is to illuminate an important moment of the ceremony, or many, as you wish. When? Well, it is really your choice but nice ideas are to do it at the exit of the bride and groom, the toast time or at the opening of the first dance. What to use? Wedding sparklers are your best shot. They are good, pretty and most importantly, cheap. Even if it may seem simple or childish, it might have a spectacular output without too much effort. Besides, it is a nice trait to make your invitees feel more involved into the celebration. You may turn them in individually, using a wedding sparkler sendoff sign or personalized vases. How? You and your spouse could be the first ones to light them up and then the rest of the guests will add up until you see a collective of flares bursting magical light! It will be perfect and memorable. Don’t forget to consider if your venue allows the sparklers and to analyze the conditions where your ceremony will be held. In any case, always keep in mind other alternatives such as using the flares for the cake or to have an outstanding photo session, especially if your wedding is at night! What do you think about using sparklers to enlighten your wedding? Night time weddings are all about romance; completing them with sparklers will enlighten and intensify all emotions! Sparklers are no longer fun accessories for Christmas; they have become allies to improve the atmosphere of any night wedding. Make sure you include them in your wedding and let their magic be part of your special day! Unique and original lighting alternatives are becoming very trendy when it comes to weddings. While some couples prefer candles, chandeliers, or other types of lightning, more and more are opting to go with sparklers. Why? Because using sparklers will allow your guests to be part of your wedding as romance and illumination are the main characters in it. Besides, they do look great in your pictures, and who doesn’t love exceptional and memorable pictures? You will find many options to include sparklers. Basically it will depend on your wedding’s theme and how or when you want to use them. For instance, you may ask your invitees to take a wand as soon as they enter the reception and ask them to draw a special figure later by using the light. You can also have someone hand the wands so the guests can light them while you are kissing or walking down the aisle. Another great idea is to include the sparklers in your wedding cake. So, when the moment of cutting the cake comes, light them: the effect will be magical. Oh! Make sure your photographer is ready to take a lot of shots. A cake full of light is something you want to remember. Now, if your plan is to get everybody’s attention, what you can do is, instead of having traditional centerpieces, use have jars and place the wands inside. Have someone in charge and, at the appropriate time, ask that person to light all the sparklers at once. You will definitely ‘wow’ your guests! The most popular option is to having your wedding MC ask all guests to participate while you and your new spouse leave the reception. They can form two lines and --just before you two get close-- light up their wands to say good bye to the happy couple while the photographer catches all the light effects. As you can see, sparklers can make your wedding unforgettable as long as you know how to use them. Feel free to use these ideas or come up with your own, and sparkle up your big day! One of the primary uses of sparklers in a wedding is to shower the newlyweds with light and shimmers as they head off from the reception to embark on their honeymoon...and the rest of their lives together! It really is a rather spectacular role to play, and sparklers really are a striking way to end the night. So, how do you have the perfect sparkling sparkler send off go off without a hitch? Here are some tips! Gather Up Supplies: Make sure to have everything you need on hand so that there won't be any scrambling, awkward waiting, or accidents. Some suggested items: two+ buckets lightly filled with water along the bottom, four lighters, all the sparklers, and safety cups for kids. Know who is doing what: For the send off, it is a good idea to assign jobs. Have two to four people handing out sparklers, another to light them, one person to act as a go between for the couple and the guests, and two people to be in charge of the buckets with water to collect the sparklers. Now, of course people handing out sparklers can also be collecting them, but the point is to assign specific jobs. Fill in the Guests: Have someone gather the guests together where they can hear and announce to them any directions. This is good to do after the bride and groom have left, but before guests, overly-excited, start heading off in different directions to send off the new couple. This is when you would tell them where to stand, who they will be getting their sparklers from, where to dispose of them when they are done, where kids can get safety cups, or any special requests like holding the sparklers up to create an arch or to swirl them around. Tip Off the Photographer: Make sure your photographer knows in advance that you are doing a sparkler exit and all of the nitty-gritty details. This will give them the opportunity to set up the shot and make sure they capture the magic of that glittering moment. Enjoy the Limelight: You should take this to mean two things. First, don't worry about any problems that do arise. Just get changed and enjoy a few quiet moments with your new spouse. Everything will work out. Then, second, don't rush through it. If you run through the send off, chances are your photographer won't have too many good shots, and it will be over too soon. There is no need to go in slow motion, but take your time. Strike a pose. Kiss. Have fun! Your guest will love it, your photographer will have a lot to work with, and you will get to end the night in a shower of light, fun, and glam. For most people, the only sparklers they know of are the traditional long stem sparkler, but if you are using sparklers in your wedding or even at a birthday party, you will be happy to find that sparklers really do come in all shapes and sizes. The heart shaped sparkler is a wedding sparkler favorite. Why? The second reason why we love the hear shape sparkler: When they are lit, it takes your breath away. How to light a heart shape sparkler has a couple of different options. You can do a single light at the base, one on the apex of each curve, at the base and and the meeting point of the curve, or a single spot on one of the curves of the heart. The more spots you alight, you can expect it to burn out faster, but when the whole thing lights up, you will get the most beautiful sparkle ever. And yes, it will look like a heart. There is no doubt that sparkler photography is absolutely breathtaking and can really make your wedding photos magical. If you are featuring wedding sparklers in your wedding decor or as a part of your send off, it is almost a necessity to have it a part of your wedding photography. If you have never done light paining photography or your wedding photographer has never done it, it may take some extra time to get it right. In a search to figure out just how light painting photography works, we were able to find some great how to's. Introduction to Light Painting in Photography by Kara Wahlgren, Kiwi Photography This tutorial by Wahlgren is straight forward and kept simple (though the shots are spectacular!). It is easy enough to understand if you are an amateur photographer that brushes up on how a camera functions outside of the point and click, and a breeze if you are an experienced photographer. She has several examples and explains what she did, why, and how it works. So, if you are wanting sparkler photography and it is the first time your photographer is doing it, this would be a great article for them to read - and just expect it to take a few trys! Commitment To Sparkle Motion: Sparkler Portraits and Light Painting by Lomo-Camkage, Lomography (The photo above from Lomography would be so great used for wedding shoot!) This how to is not quite as straight forward, but it is very detailed and has a ton of examples. It is not focused on wedding photography per se, but has a lot of great ideas that can inspire some beautiful photos. Also, it has some great info and tips on what kind of sparklers to use and how it really works behind the scenes. Sparkler Fun - Tips & Tricks by Corine, StudioTran Photographers This article is less of a step by step, but still has some great info. It is very detailed and can fill int he gaps where the other blogs might be vague. The absolute basic to know how this works is that it involves having a long/slow shutter speed so that the light can be captured and having a 'painter' to run your light around. Sparklers are pretty. Sparklers at weddings are pretty cool. Kids are pretty cute. Kids at weddings are pretty fun. Kids and sparklers at weddings need some precautions. Basically, what you don't want happening is a kid poking their eye out, burning their finger, their clothes, the table clothes, or your wedding dress. Don't let kids under the age of 8 handle their own sparkler. When handing out sparklers for the send off, give all the sparklers to the parents to give to their kids in order to decrease the amount of eager running around to get a sparkler. Have a specific plan for putting out the sparklers or throwing away the used (hot!) sparklers - ie. bucket of water, specific people to give the sparklers to, etc. For younger children - maybe even 10 and under - have "sparkler shields" ready. These can be cute decorated cups to go with your wedding, or just the typical red cup with a hole in the end. It is a quick and simple solution to hurt fingertips and runaway sparks. It is easy to have accidents within large groups of people, kids running around, and hot pokey things. Just take a few steps to keep things safe and organized, and you won't need to worry. Additional to the safety tips, you may want to put someone in charge of the send off to make an announcement of the plan for the sparklers and any rules you want laid out. For example, if it is important not to get any black marks on your venue's flooring, make it clear that used and lit sparklers are not to be thrown on the floor and are to be put in such'n'such container/bucket/sizzle out station. Safety first equals a worry free and spectacular exit. If sparklers are going to be a part of your wedding send off, then you are going to want to give your guests the tip off. Send off schedule signs are a great way of letting your guests know when to expect the celebrating to come to an end. This is helpful because it allows guests to plan when to leave without missing out on the sparkling send off fun. It is always a shame when a guest realizes that if they had stayed 15 minutes longer, they wouldn't have missed the sparkler send off. When using sparklers, it is particularly useful to include a sign because then the sparklers become a part of the aesthetic and style of the wedding, rather than just the ending show. This can also be done more effectively by displaying your sparklers with the sign. 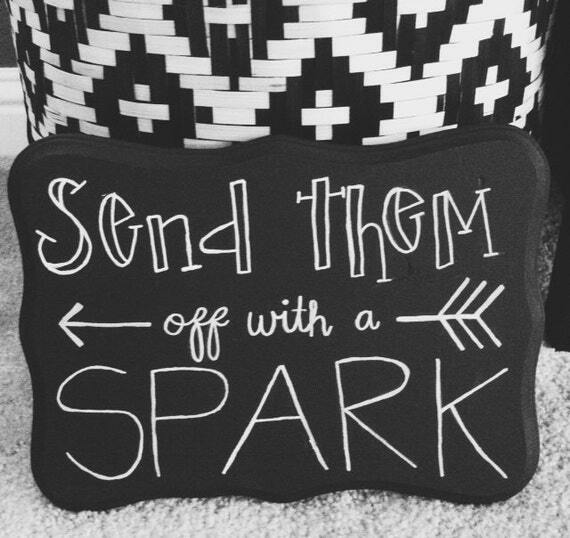 Regardless, a sparkler send off sign can be a wonderful addition to your reception decorations. When deciding on you sign decor, you have quite a few options, starting with deciding if you are going to make you sign or buy one. Making you sign can be a lot of fun and doesn't have to be complicated. It can be as simple as using a chalkboard and having someone with good hand writing or artistic savvy write a saying and the time of the send off. Typically, the wording of these signs will say something like, " Send them off with a Sparkle - Sparkler Send off at TIME". Or if you would like to buy an already made sign, you options become even bigger as you gain access to craftsmanship that you usually wouldn't have. For example, The Wedding Sparkler Store has a beautiful selection of etched acrylic (looks like glass) sparkler display signs. They are completely customizable to suite your needs and can include sayings like "Let Sparks Fly" and " Let Love Sparkle". It is like having the DIY without the work and with the added pizzazz. The sparkler send off is so popular that it is becoming a part of wedding tradition and, quite frankly, it is a tad more magical than rice being tossed. With this, and the many other ways sparklers are being used at weddings and events, there has become a need to figure out how best to display and set up sparklers (thin sticks) before they are used, so that they can be decorative in their unlit state. Basically, there are two main methods for sparkler set up at weddings (and other events): The bucket and the bundle. With this, you will have one to two buckets, vases, jars, etc. that you will fill with your sparklers. It is as simple as that! This can be a fun and easy option because all you need to think about is finding a container that fits your wedding theme. For example, if you are having a shabby chic wedding, then a tin bucket or watering can may be perfect for you! This method of sparkler display can be a little more time consuming, but also completely worth it. Here you will create or purchase tags or sparkler sleeves. These are fun because you can customize them to your wedding with fun sayings or your wedding monogram. If you are doing this yourself, it can take a bit more time, though it does offer you a lot of freedom in the design. The other option is to find and buy a sparkler packet that suits your needs. The bundle method also works great if you decide to use sparklers as your wedding favor. How to display and handle sparklers at weddings are becoming more diverse and even sophisticated as this fun way to exit a wedding and celebrate is becoming a loved wedding tradition. The bucket and bundle display methods can of course be combined by putting the bundles in the bucket, but they do work well on their own. What creative ways have you seen brides display their wedding sparklers? The Wedding Sparkler Store is a one stop shop for all of your sparkler needs, whether you are looking to light up your wedding or add some sizzle to another event. Sparklers have never been so diverse as they are today. With their growing popularity at weddings and parties, they have transformed to not only include the twinkling firework we all grew up with, but also varies in shapes, sizes, and even ways of using and displaying them. That is where this sparkler store blog and inspiration board comes in, hoping to provide you with all the tips, tricks, and trends, of event sparklers. The Wedding Sparkler Store is not only a one stop shop, but also a ones stop resource, providing you with not just the materials you'll need, but all the info you need to have a spectacular sparkling event. What makes sparklers so special? They can be used in variety of ways including but not limited to, wedding send offs, "candle" lighting ceremonies, and in wedding photography. They are also at home as a part of graduation, anniversary, birthday, and holiday celebrations. Just holding a lit sparkler will bring a smile to anyone's face, be they child, teen, or normally grumpy grandpa. There is something about a sparkler that just brings child-like joy to a person, creating an environment of excitement, pure happiness, and fun. Just like every snowflake and star are different, each sparkler is different. Sparklers add a fun twist to modern traditions and will fuse your wedding or event with creativity and the same simple elegance of the stars sparkling in the sky. These event sparklers really would be the perfect touch for your wedding or event. With a variety of bundles including different shapes and sizes, you can't go wrong at The Wedding Sparkler Store. Find the shimmer and just let it shine!